1.	a. 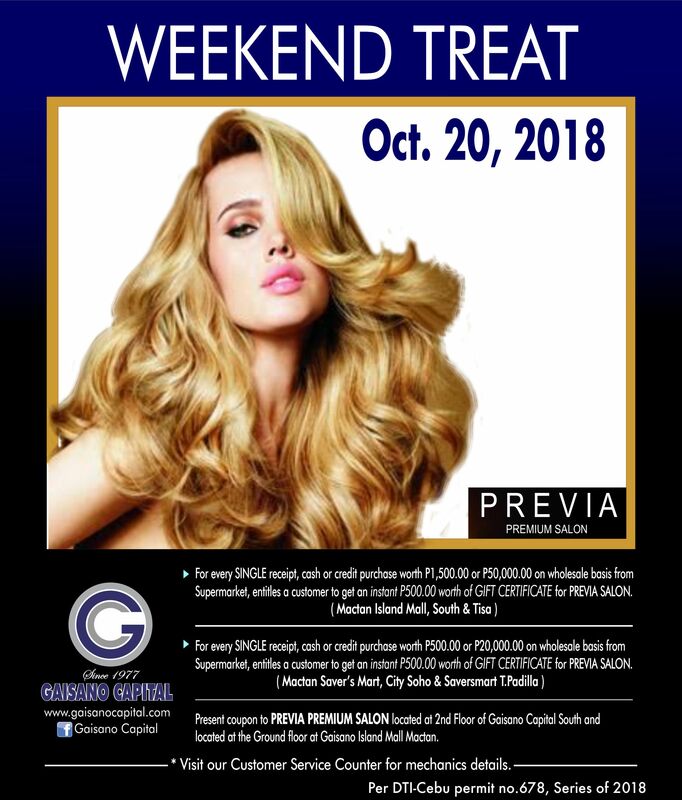 For every SINGLE RECEIPT, cash or credit purchase worth Php 1,500.00 or Php 50,000.00 on wholesale basis from Supermarket, entitles a customer to get an instant P500.00 worth of Gift Certificate from PREVIA PREMIUM SALON (Gaisano Capital South, Gaisano Mactan Island Mall & Gaisano Capital Tisa branch only). b. a. For every SINGLE RECEIPT, cash or credit purchase worth Php 500.00 or Php 20,000.00 on wholesale basis from Supermarket, entitles a customer to get an instant P500.00 worth of Gift Certificate from PREVIA PREMIUM SALON (Mactan Saversmart, City Soho Mall & Saversmart T.Padilla branch only). Visit Redemption Counter for mechanics details.